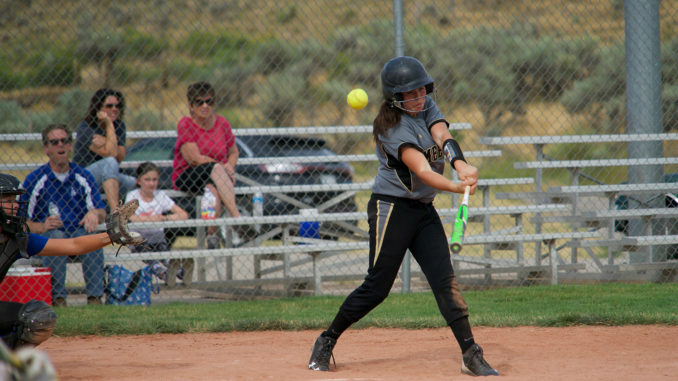 Meeker's JV softball team hosted the Fruita Wildcats in a doubleheader, winning one and losing one. MEEKER | The lady Cowboy softball teams opened up last week with both varsity and JV hosting doubleheaders. Some much-needed rain Friday into Saturday forced the varsity to move its games to Rangely Saturday due to submerged fields in Meeker. In game one, the Meeker Cowboys triumphed over the Montezuma-Cortez Panthers softball team by a score of 14-0 for Saturday’s league outing. No. 3 Tori Lasker was selected Meeker softball player of the game for her “outstanding pitching with complete game shutout,” said head coach Briana Williams. Honorable mention in game one went to a lineup of strong bats and excellent fielding. Gracie Bradfield was three for four, Megan Shelton went two for three and had a big home run, Brynlee Williams went three for three, and Makenna Burke five for five in the field at second base. Game two of the doubleheader found Meeker on top once again with an 8-7 win over Montezuma-Cortez. Megan Shelton was named player of the game for her perfect game at the plate, a game-winning homerun and solid defensive play behind the plate and at shortstop. Honorable mention to Gracie Bradfield for another solid batting game and going 4 for 5 at the plate and scoring twice and Tori Lasker who pitched six innings of relief pitching and took the win for both games of the day. The lady Cowboys are now 2-0 on season and will be traveling to Eaton, Colo., Aug. 24-25 for a tournament with an opening game against Lamar, Colo. The next home game for Meeker softball is Tuesday, Sept. 4 with a doubleheader against Cedaredge, Colo. The junior varsity softball team also opened its season this past week, hosting Fruita, Colo., on Friday, Aug. 17 in doubleheader play. They went one for two on the afternoon losing the first game 11-8 and winning the second game 23-9. JV will see action again Tuesday, Sept. 11 in Basalt.